There are many types of kofta, and spellings, including (but not limited to), kofta, kafta, and kufta, cooked in various countries and regions around the world. An unverified report on Wikipedia stated that in Turkey alone, there are 291 different kinds of kefta, or kofta. I don’t know how many kinds or varieties are available in the United States, but I know that if something comes from Tartine in San Francisco, you can be sure it’s going to be very good. Started by Elisabeth Prueitt and Chad Robertson, Tartine Bakery & Café become became famous around the world for Chad’s hearty, air pocket-filled, crusty bread, and Elizabeth’s baked goods. Back in the day, that part of San Francisco was mostly known for its proximity to the Mission, where we all went for burritos and Mexican food. But the small stretch of 18th Street where Tartine rests on the corner, now has an ice cream shop, a food shop, a couple of restaurants, and probably a few new places since my last visit. 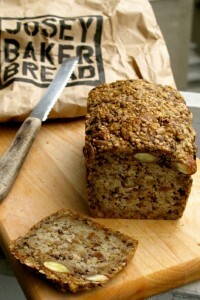 Like me, bakers can’t live on bread and pastries alone (although some of us sure try! ), and Elisabeth decided to share the recipes she makes for her family and friends at home in Tartine All Day: Modern Recipes for the Home Cook. It’s always hard to describe “American Cuisine” because being a melting pot culture, we don’t have many constraints. It’s not unusual to have an omelet, sushi, tacos, and a hot dog, on the same day (and sometimes, in the same restaurant), all of which originated elsewhere. And thank goodness, because it would be boring eating oatmeal and grilled steak every day. Although come to think of it, oatmeal may be from Scotland, and whoever can determine who grilled the first steak has a lot more time on their hands than I do. Tartine All Day celebrates the variety of foods that Elisabeth makes at her home in San Francisco, including coffee cake, whole-grain “risotto,” cheese and corn soufflé, lamb with mint salsa verde, pistachio madeleines, jams bars, cornmeal-ricotta upside-down cake, and the Tartine chocolate-almond cake. And thanks to her book, now we can too. Because Elisabeth has a gluten intolerance, the recipes were created with that in mind, although the rest of us wouldn’t feel like we’re missing anything if we made them. Case in point is her kofta recipe. Cracked wheat (bulgur) is often used along with the ground meat, but Elisabeth’s version has quinoa in them, so they’re accessible to others. Who can argue with making food that’s more available to more people? What I like about recipes like this one is that it takes a simple concept – grilled ground meat – but gets spiced and seasoned, turning it into something more exotic and interesting than just a plain ol’ patty. And like the best cookbooks aimed at home cooks, Elisabeth gives options for hard-to-find ingredients and skips fussy techniques. For example, if you can’t find the ras el hanout spice mixture, she gives a quick recipe to make your own, or notes that you can just increase the other spices by 1/4 teaspoon. Yes, you can turn that famous Tartine chocolate cake into cupcakes. And if you don’t have tapioca flour for her sticky date pudding with hot toffee sauce, but really, really want to make it, you can swap it out with cornstarch. – Make meatballs with the mixture and pan-fry or grill them, especially interesting if you want to serve them as an appetizer for a party. – Wrap the meat around the skewers in long cylinders (like a cigar), rather than in flat patties. – Omit the skewers and form the meat into patties, and pan-fry or grill them. If shaped into rounds, the kofta mixture would make good burgers, served on a bun. Elisabeth recommends adding the meat to skewers in several (two or three) steps, which she says helps the meat stick together. I went rogue and made ovals, which worked – well, mostly. I did have one fall off the skewer when I turned it over, so next time, I’ll heed her advice. Adapted from Tartine All Day: Modern Recipes for the Home Cook by Elisabeth PrueittI changed the recipe a bit, grating the onions rather than chopping them. While red pepper flakes probably aren't traditional, I liked the little bit of spiciness they added. 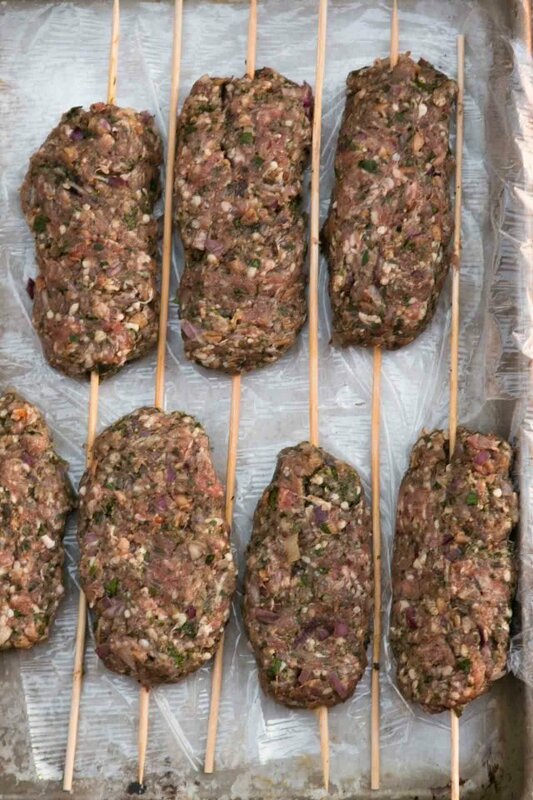 If you have it, you could try these with Lebanese spice mixture, baharat in place of the ras el hanout, which would add another kind of spicy aroma.Because Elizabeth is gluten-intolerant, she uses quinoa in her kofta. She cooks 1/4 cup (45g) of rinsed quinoa in 1/2 (125ml) water with a large pinch of salt for 15 minutes in a small saucepan. Remove from the heat and let sit for 15 minutes, covered. To plump bulgur, start with the same amount of bulgur and hot water, bring to a boil, cover, then remove from heat. Drain and gently squeeze out any extra water. But different types of bulgur can vary so check the instructions for the bulgur that you're using for recommendations on how to prepare it.I prefer to use regular, rather than Greek yogurt, for the sauce. Greek yogurt is quite thick and if you do use it, you may need to thin it with water or milk. 1. Soak 8 wooden skewers in water for 30 minutes. Put all the ingredients in a medium-sized bowl, except for the onion. 2. Grate the onion into the bowl with the other ingredients. 3. Use your hands to gently mix the ingredients together until well-combined, but do not overmix them, which can make the kofta tough. 4. Divide the ground lamb mixture into 8 portions and using your hands, shape one part into an oval about 4-inches (10cm) long. 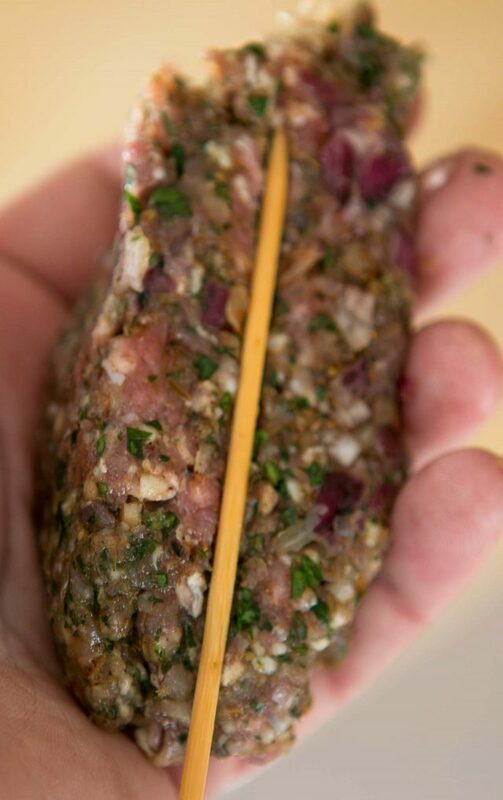 Press one skewer in the center then use your hands to mold the lamb around the skewer, finishing by pressing it flat. 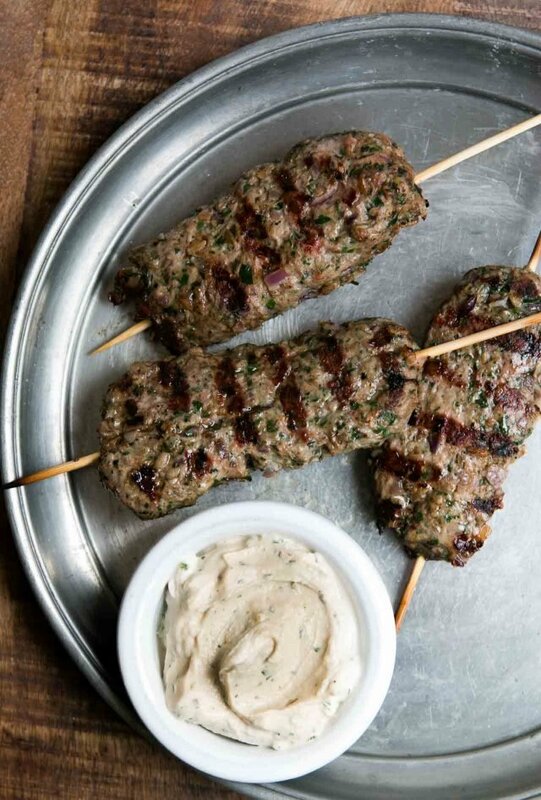 Lay it on a tray or plate, and repeat with the remaining ground lamb and skewers. 5. The skewers can be cooked over a hot grill, brushed with oil, until cooked through, or in a grill-pan or skillet on the stovetop, turning them over midway during cooking. They'll take about 6 to 8 minutes, total, to cook. 1. In a medium-sized bowl, mix together the tahini, garlic and salt. 2. Stir in the yogurt, lemon juice, parsley and red pepper, until smooth. If the sauce is too thick, thin it with a small amount of water or milk. Add additional salt, lemon juice and pepper, to taste. 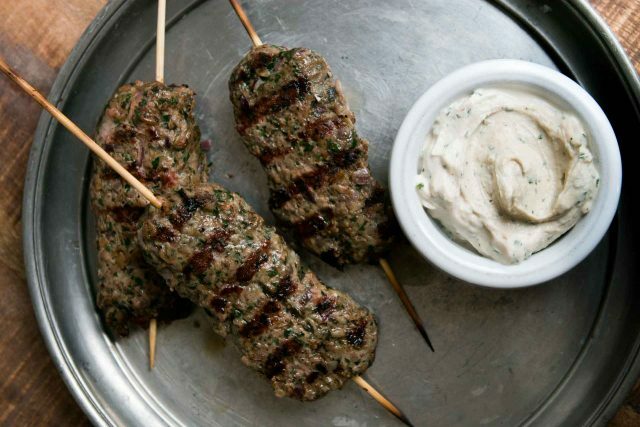 Serving: Serve the kofta warm with the yogurt-tahini sauce. It goes well the flatbread, as part of a meze (appetizer) platter, with a green salad, or alongside tabbouleh. 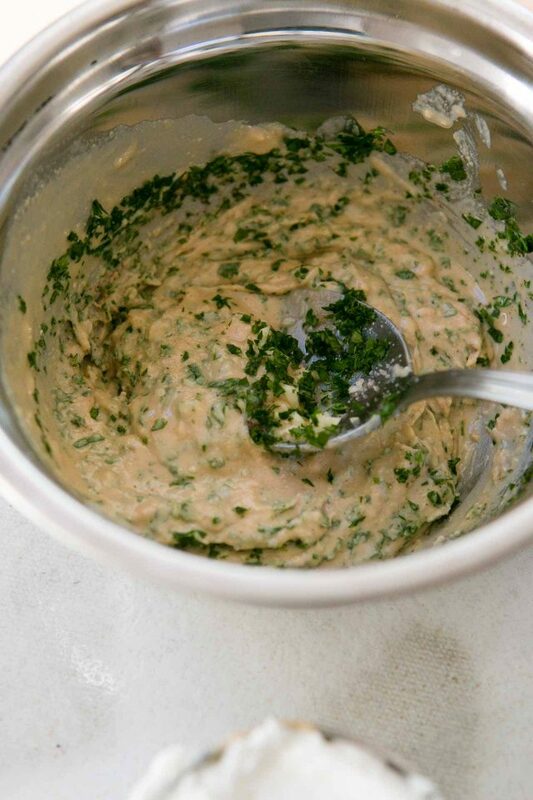 Instead of the Yogurt-Tahini Sauce, you could also serve them with Tzatziki. Storage: The uncooked kofta can be kept in the refrigerator for up to two days. The mixture can be frozen for up to two months. The sauce can be made up to five days ahead. Also try Ottolenghi’s recipe from Jerusalem. Really first rate. I freeze them raw for quick week night dinners. I used 1/4 cup of cooked cracked wheat. I just cook mine in water until very tender, then drained off and gently squeezed out any excess water. (It doesn’t matter if you have a little more or a little less bulghur.) I linked to a recipe for cooking bulgur at the end of the post, but most varieties you can simply pour boiling water over it and let it absorb the water, then drain any excess off. Could you please specify what Elizabeth did to prevent the meat from falling off the skewers? You mentioned 2 or 3 steps, but didn’t tell us what they were. Many thanks! The steps weren’t entirely clear to me but I followed up and found out that you take a skewer and add the meat to it in pieces – one at a time (in 2 or 3 pieces) to “build” the patties, but I was getting long-winded so I just mentioned how I did it, which works fine, without being fussy. I used Greek yoghurt ( because that is all I had) and it was perfect. Why did you suggest not using it? Even though it’s breakfast time, my mouth is watering for these. Your comment about baharat isn’t clear – do you mean as a substitute for just the red pepper flakes – or for both the flakes and the ras el hanout? Sorry that wasn’t clear. A lot of people inquire about substitutions so I was trying to offer some (probably too many…) but was concerned about getting too wordy. You can swap it out for the ras el hanout. I added text to make it more clear. If you try it with the baharat, let us know how they turn out! nice! perfect in season recipe :) i love Elizabeth and Chad and everything they do–probably the best of SF, IMO..
Love yoghurt and tahini sauce! It’s great served with kebabs as well, of course. And I use it in a recipe I found a few years ago, can’t remember where, as a dressing for chunks of iceberg lettuce. 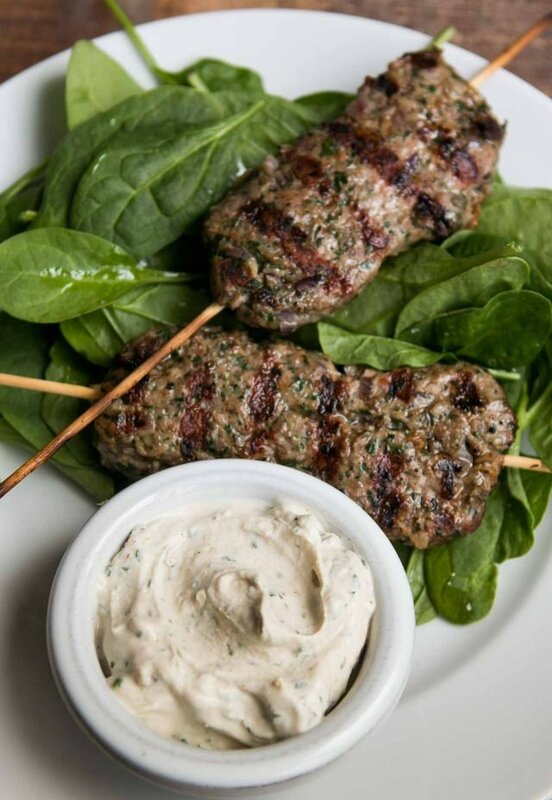 Good quick meal – kofta or kebab, iceberg with tahini/yoghurt dressing, and boiled potatoes dressed with oil and mint. A Greek friend told me never to store tahini in the refrigerator, turns it bitter. True. Store in a cupboard, the oil layer on top seals it. David, your take? Elisabeth Prueitt is gluten intolerant?? It’s a cruel cruel world. Is your Parisien butcher happy to grind lamb? Do you the have to specify the cut? This looks and sounds so good I’m salivating…checking out all Lebanese restos in Paris for Kufta..but it wont be the same. Denise: Yes, I’ve not seen it sold already ground but they will grind it for me. Chris: Thanks. Fixed the typo. Sandra: I’ve not heard that but I try to buy very good quality tahini. (I ask friends to bring it back to me from the Middle East.) For people who live in the U.S., Soom is a brand that people like a lot. Thanks for the recipe. Feast in San Antonio has these in their menu and its my favorite thing to order. Love her book too. Can’t wait to prepare this recipe! My husband is allergic to lamb, so I was wondering if I substitute with turkey, do I have to change up any of the other ingredients, or if I use listed ingredients, will the quantities change?? Thanks! Yes, ground turkey (or another ground meat or poultry) would work. Because turkey is leaner, you will likely need to reduce the grilling or cooking time. And because turkey is milder than lamb, yes – feel free to dial up the spices and seasonings, too. I am also allergic to lamb so used ground turkey and ramped up the chili a bit. Very good! I do love a highly seasoned meat patty! I can’t wait to try these – and am adding this book to my collection. The recipes have that winning combination of both unusual and accessible! Hello. I have subscribed to your blog for several years, and your book, The Perfect Scoop, has opened up a new world of making ice cream for me. Friends and family request that I bring some to every dinner! I have a quick question. 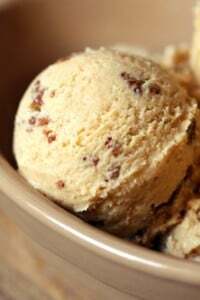 Can the custard be made 2 or 3 days before the ice cream is churned if kept refrigerated? Thank you for this and all your recommendations about Paris that have added to my experiences visiting there. I made this recipe for dinner tonight. Easy, fun to make, filling and delicious! Served with a salad. Used my splatter guard and vent fan. There are leftovers for tomorrow’s lunch. You may be able to get minced lamb in Lidl – they certainly sell it on this side of the Channel. 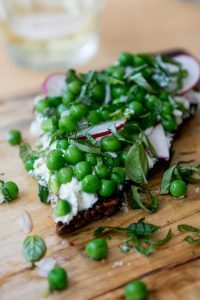 This recipe looks lovely – I must try it! If only for the tahini-yoghurt sauce which sounds to die for…. Oooh… I love lamb though I’ve never prepared it at home. If I see it on a menu, it definitely makes deciding what to order easier. Sounds delicious. Absolutely superb! Thanks so much for providing this. Followed kofta recipe exactly using bulgur. Reduced Stonyfield plain yogurt to 6 oz cause that’s one container. Worked beautifully. Thanks again! SO good! I lived in Cairo for a couple years, and this satisfied my craving for Egyptian street food. The sauce thinned down a bit makes a great dressing for a tomato/cuke/chopped lettuce salad, with just enough raw garlic to repel vampires and co-workers. Thanks for this! So good! I made it for an alfresco picnic and it got rave reviews! My chef friend even asked if I could make it as bite-sized appetizers for a mutual friend’s upcoming birthday party! am also allergic to lamb, so glad to know I can use turkey. Make both ras el hanout and baharat so will try a portion in a divided batch of meat when I make these.